Fishfinder 350C comes with a high resolution (272 x 480 pixels), full colors (256 colors), and Sunlight-Readable 5” WQVGA display. Its sharp color helps you never lose any fish. Benefit for the professional fishermen like you, Fishfinder 350C features with dedicated button on its right side for you to quickly adjust the setting you need for “Gain”, “Range”, and “Zoom” function. Putting its 5” WQVGA display vertically, Garmin offers you an intuitive comparison when using the “Split Screen” on Zoom or Dual Frequency page. Are you worried about your Fish Finder being stolen? Easily remove Fishfinder 350C from mount and take the device with you off boat. 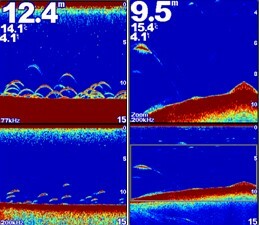 The Fishfinder 350C is one of the most intuitive fishfinders in the market. Installation takes only a few minutes with using the tilt/swivel mount and versatile transom/trolling motor-mount transducer included in the box. Additional *Depth capacity is dependent on water bottom type and other water conditions.